It’s amazing what photography can achieve when imbued with artistic ingenuity, unity and smiles of hundreds of enthusiastic kids. In a chaotic world, where sadness, decline and decay make the headlines, ABC Charity creates captivating art that engages children to dream of a brighter world and helps kids in need. Nature is their canvas and young girls and boys become the creators of a letter that spreads positivity both visually and vocally. ABC Charity is a Swedish non-profit organisation that turns ordinary letters into works of human art. 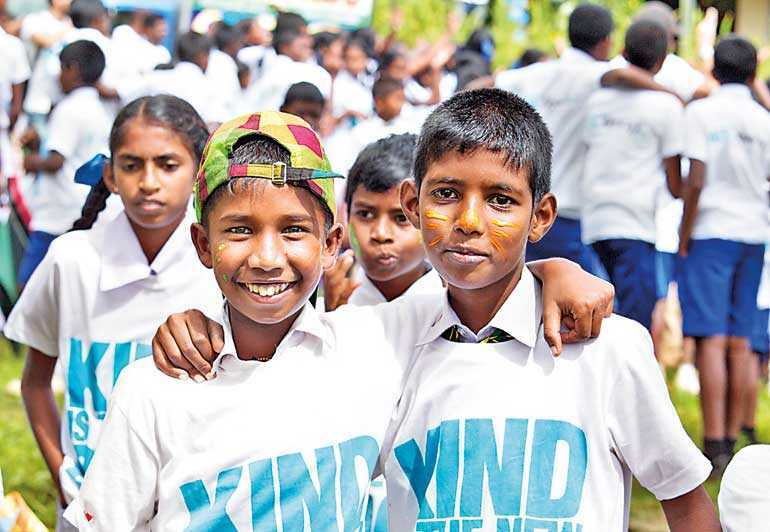 The team is on a mission to create the world’s largest and only human alphabet, bringing thousands of children and their dreams into the spotlight, letting them embrace a world where ‘Kids Help Kids’. The ABC Charity Team traverses the seas, treks mountains and goes beyond borders to meet different people, taking a simple idea around the world – the power of kindness. As of June, 10 letters of the alphabet have been created with the participation of around 9,000 kids from South Africa, Namibia, Sweden, Germany, Norway, Croatia, Thailand, India and Sri Lanka. The ABC Charity Alphabet series will eventually be one of the world’s largest fundraising Art for Charity projects. It’s a one-of-a-kind initiative which brings joy to thousands of kids and helps to raise up to $ 115.7 million for children in need. 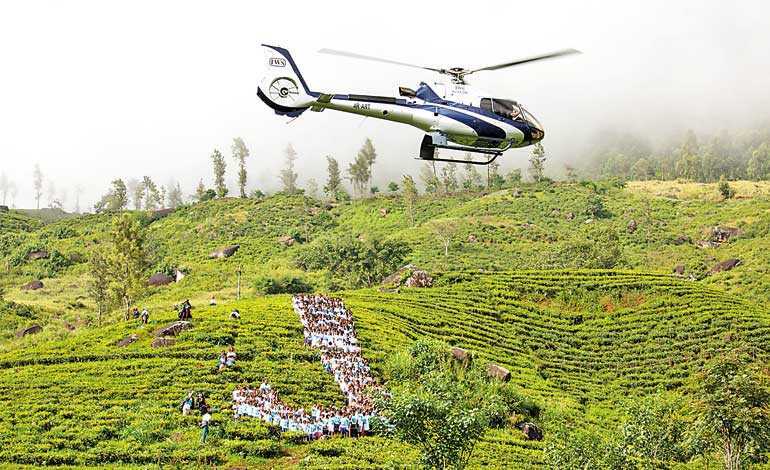 Together with Dilmah Tea and its philanthropic arm, the Merrill J. Fernando Charitable Foundation, the ABC Charity created the letter ‘J’ in Sri Lanka. 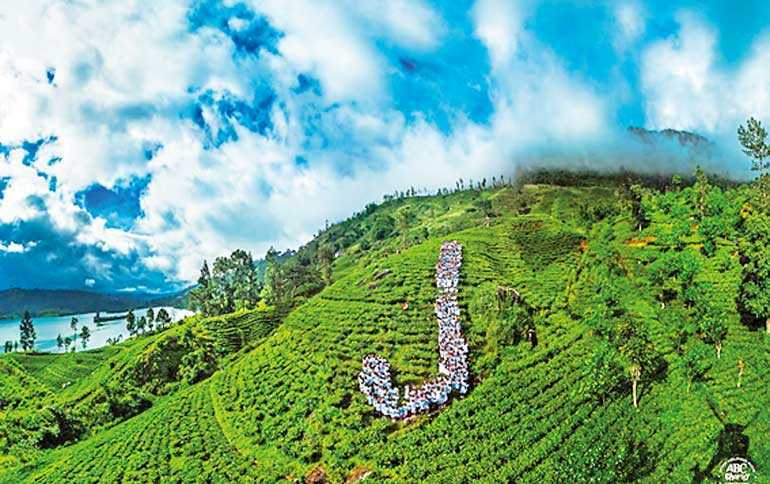 The letter ‘J’ was shot on 5 June in the verdant tea fields of Dilmah’s Dunkeld Estate overlooking the Castlereigh Reservoir close to Hatton, featuring 500 children between the ages of seven and 13 from two schools on Dunkeld and Carfax Estates. For kids at Dunkeld and Carfax schools who took part in this wonderful initiative, it turned out to be a memorable experience which they relished from the bottom of their hearts. The letter was shot from a helicopter by photographer Filip Cederholm Agoo, Founder and Photographer of ABC Charity. Filip travels around the world with a purpose; as an impact photographer, he creates to contribute to the change he wants to see in the world. Filip gave up his career in commercial advertising to devote his life to help others. That is something incredible. Currently, he enjoys working with kids and believes that there is no better way to empower the little ones to give back to the society than through art and fun. “We want them to be advocates of kindness and show them that happiness is the way to create a positive change in the world.” Creating this masterpiece was a moment of togetherness which brought together two teams and kids from two schools towards one goal – that is to create the best J possible. 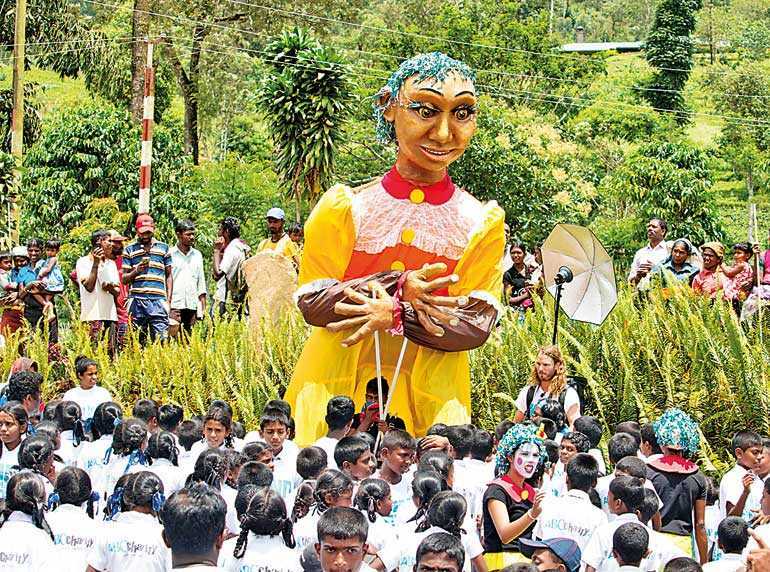 MJFCF Youth from Moratuwa volunteered to support the ABC Charity event and they enthralled the audience with their mind-blowing performance with the Giant Puppet. This was a first time for many of the young kids from the estates. “The entire production was a sheer joy for the MJF Foundation and Dilmah teams; where usually the focus of life on estates is negative, this featured their potential through the young, vibrant and thriving communities that they are,” said Dilmah Tea CEO Dilhan C. Fernando. Every photo of the ABC Charity Alphabet has a fascinating story. Prior to the event, the ABC Charity team met up with the locals and engaged and the kids from the schools around Dunkeld Estate. “It’s important that we let the kids – the creators – familiarise themselves with the whole concept of our Art Charity,” says Filip. A few days before the letter J was created, there was an entertaining session with the kids. “We learnt a lot about the local culture and made a good rapport with the school staff, kids and neighbouring communities. We are glad to have worked with a beautiful company like Dilmah to make this project a success,” says Filip. The limited edition photo alphabet art will be sold in the ABC Charity web shop through which local and global charities will benefit from the purchase of the letters, with a minimum of 90% of the funds from the web shop sales supporting children’s education and wellbeing in the country it was shot in. “Charity is all about the dignity of the recipient. 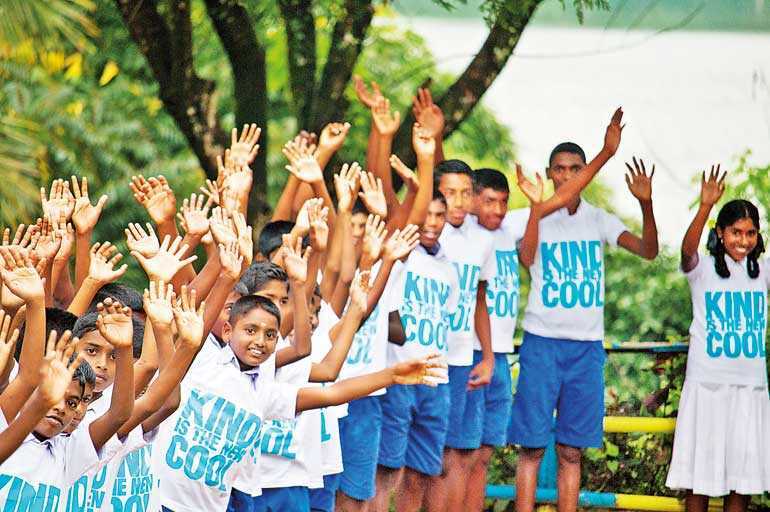 Through this incredible experience, we are sending out a powerful message that urges us to corporate and partner up to help kids,” says Dilmah Tea Chairman and Founder and MJF Foundation Settlor Merrill J. Fernando.